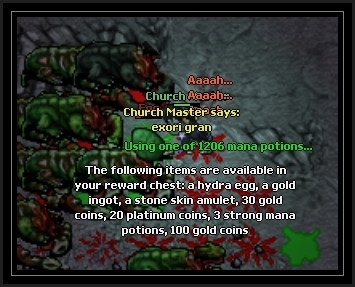 My name is Bosst from Nerana (originally Church Master, but I got namelocked) and I started hunting bosses like 3.5 years ago. Today I would like to present you my way to kill the Welter solo. I know that there are maybe better methods, but no one is perfect. ???? And this is just an example. I'd recommend lvl 250+ (my lvl was 286 at the time when I killed this Welter). We are able to use supreme health potions then and umbral master weapons. Supplies: at least 150 supreme health potions and 1500 mana potions should be enough. Proper eq and skills. The Welter, his spawns and hydras don't hit high with melee, so any eq with a skill boost might be a good idea. The easiest scenario is when we find Welter not too long after it spawned. We should then destroy the eggs as fast as possible and just proceed with killing boss. But most of the times it's not that easy. Let's analyze my example. Not that bad, just 2 spawns hatched from the eggs. You need to remember that those spawns heal themselves and that Welter can devour them to heal himself. It's important to get rid of them before we start killing the boss. I destroyed the egg which was blocking my way and quickly lured the Welter south of the cave. Then I could kill the spawns and destroy the eggs without any problems. With spawns and eggs cleared we can proceed to slowly lure the boss near the stairs. Welter heals much and quite often so try to do it as fast as possible. Whenever an egg appears, move with boss to stand next to the egg, so you will destroy eggs and kill boss at the same time. Don't let the spawn to hatch, because things might get hard. Whole procedure with luring and killing took me about 12 minutes so prepare for quite a long fight. Killing Welter solo is quite a thing, you could say. Unfortunately that doesn't mean you will get good loot. And the final hint - remember to look before you leap. If you go down the stairs and see the welter with for example 7 spawns it will be extremaly hard to use tactic described above. Don't get yourself surrounded by hydras/spawns. However if your level is 400+ you can try to use utito tempo+spells while going up and down the stairs. This should be enough to kill spawns with 2 or 3 hits (spawns have about 2k hp). Then you can skip the luring and just proceed with killing the boss and destroying eggs. Thank you for your time. Please don't judge me too strictly as this is the first time I'm writing something like this. I hope that some of you will find this little article interesting and useful. Feel free to leave your feedback here. If you like it, I have some more ideas for a "guide" like the one above. I think the hard part is at the beginning, it is not easy to lure Welter and Spawns out. Exactly, that requires some skill to run, heal and cast utani hur at the same time to get rid of the strong paralyze. I linked this post to the bossopedia on The Welter page in "Interesting and useful facts". Nice guide, i will try it next time ! Thank Apoc. This guide is a little bit outdated, as now we have imbuements. It should be much easier with crits and life/mana leech.